So, Uryu, preparing to use his freaky new bow, asks Haschwalth why he's even questioning his character in the first place, adding that he should be trying to finish their fight as quickly as possible and get to Ywach to defend him against the threats. Haschwalth blows it off, answering that from using The Almighty, he's already seen that Ichigo et al. will fail. 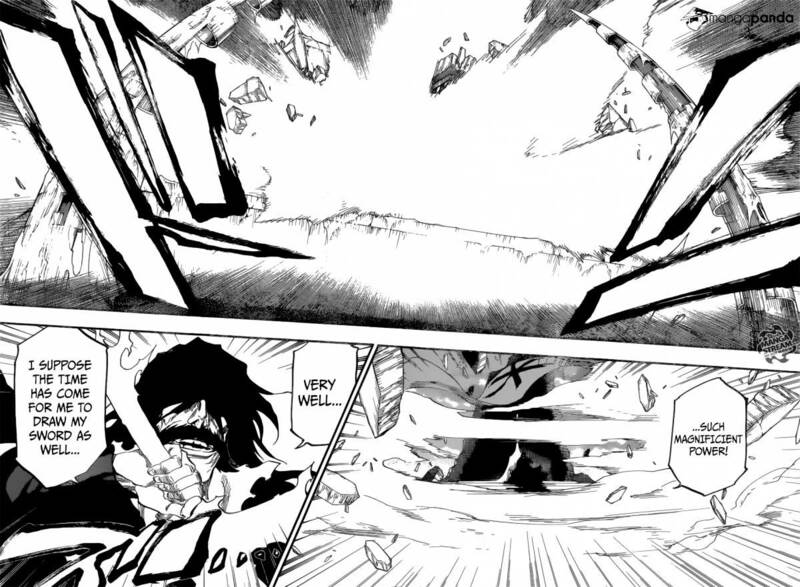 Uryu makes the point that The Almighty can't be infallible, given that Haschwalth was surprised by his new bow. Haschwalth says that nuh-uh, The Almighty totally is infallible, but only when the events directly concern Ywach. He cheekily adds that the Almighty also has another, darker secret to it, but when Uryu asks him what he means, Haschwalth refuses to tell him until they've "settled" things. 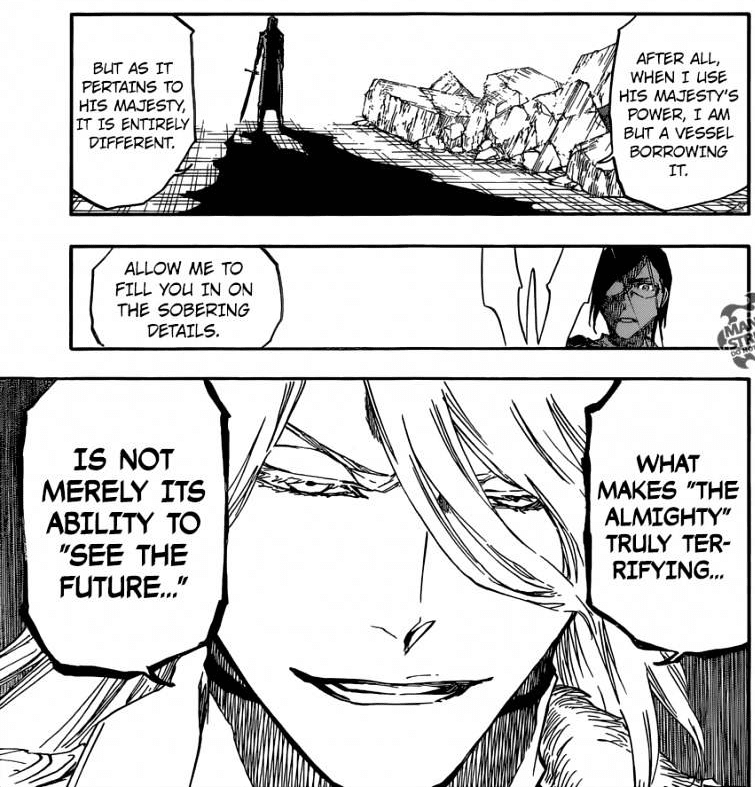 He makes another reference to Uryu's "scales" and "balance", and still fails to just say what his Schrift is. Haschwalth's the kind of guy who's technically good at keeping secrets, but feels compelled to drop hints and do little eyebrow theatrics at every opportunity. In the throne room, Ichigo goes crashing through another pillar (because this is Bleach, none of these pillars serve any actual structural purpose - they're strictly for when you need to destroy something). As he starts to charge back at Ywach, Orihime grabs his clothes, imploring him to calm down. 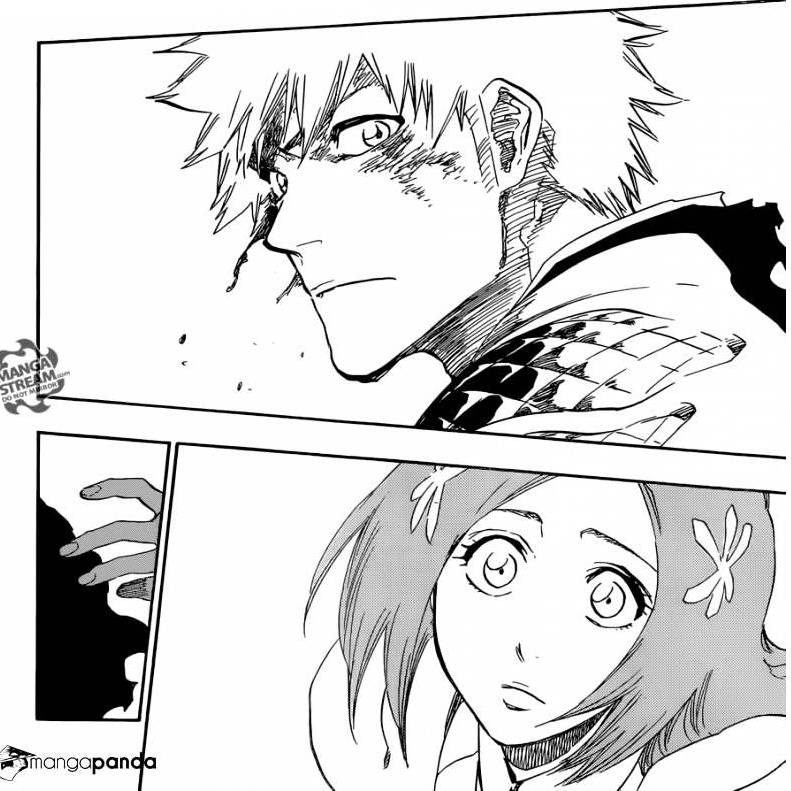 He stares at her for a moment, blood trailing down the side of his face, and resumes the charge when Orihime lets go. 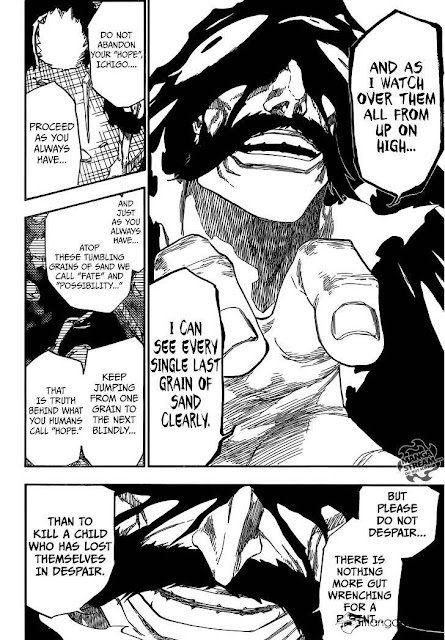 Ywach keeps up the taunting, asking if Ichigo is afraid of using his full power for fear of having it snatched away from him and reminding him of all the apocalyptic things he's going to do to Soul Society and the human world if Ichigo fails. 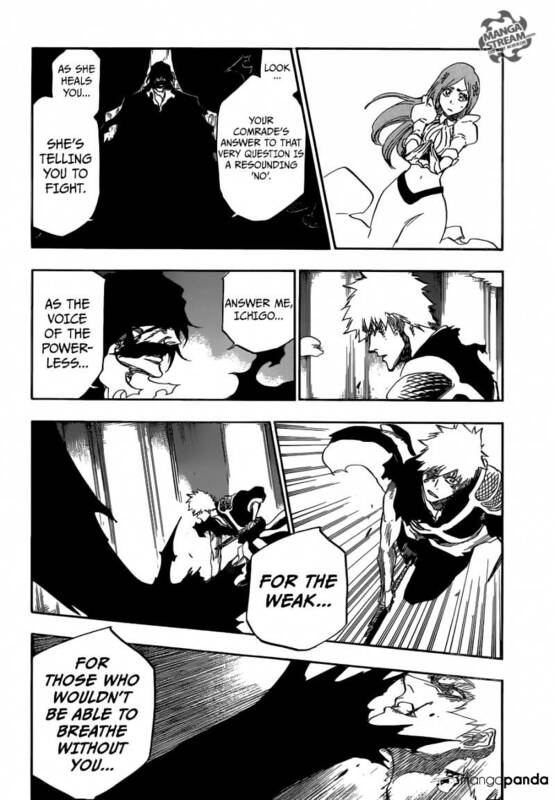 Orihime uses Souten Kisshun to heal Ichigo, and Ywach notes this, telling Ichigo that by healing him, she's implicitly telling him to keep fighting for her, and for "the weak". Ichigo cuts away some of the black energy and looks at the tip of his blade, which is turning white. He yells for Orihime, who uses Santen Kisshun to block the rest of the attack (I think). He thanks her, and she thanks him in turn for stopping when she grabbed his robe. She says that he had a weird look on his face when she grabbed his robe, and that she thinks there was a reason for the look. He confirms that there was, explaining that there was "someone" he needed to awake. More of his blade has turned white, and some Quincy-esque arteries/veins are creeping down it. A blast of light occurs behind their side of the shield, and when it clears, it's revealed that Ichigo has entered a new, partially Hollow-fied form. "So that was your endgame... to became a bad Homestuck Troll OC cosplay. Magnificent." Orihime gapes in shock at Ichigo, so he grins and reassures her that despite the resemblance to his psycho Hollow/Zanpakutou Zangetsu side, he's still firmly in control. 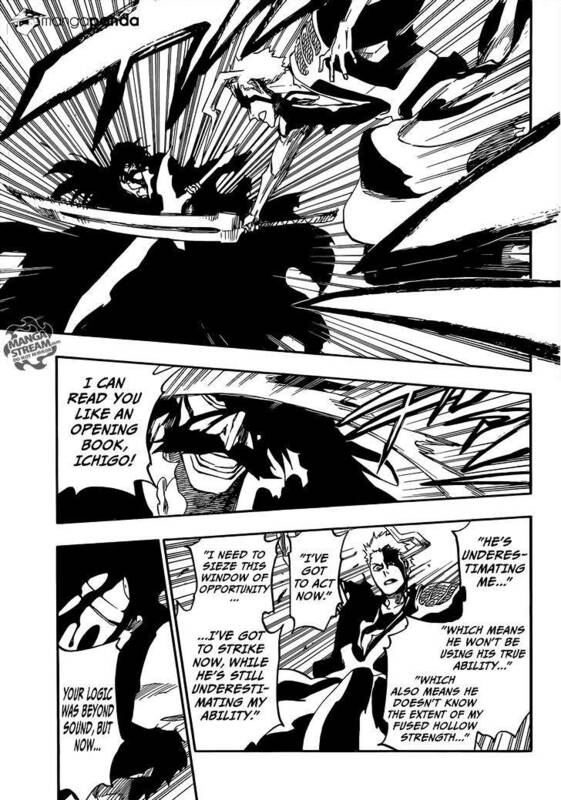 Ichigo explains that he reforged his Zanpakutou after balancing his Hollow-Shinigami and Quincy sides, and that if the balance gets disrupted, then logically "they" should come forth, which has always happened with Hollow/Zanpakutou Zangetsu when he used his Shinigami powers. 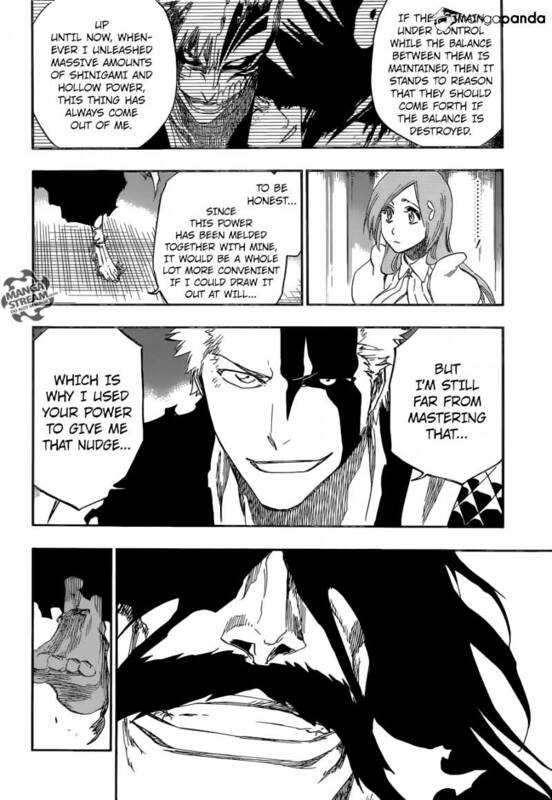 Ichigo adds that he since he has trouble mastering it on his own, he used Ywach's power to give it a boost. Boost what? The imbalance? Was he absorbing Ywach's Quincy-based attacks, and to compensate for all the Quincy energy, Hollow/Zanpakutou Zangetsu partially came out? 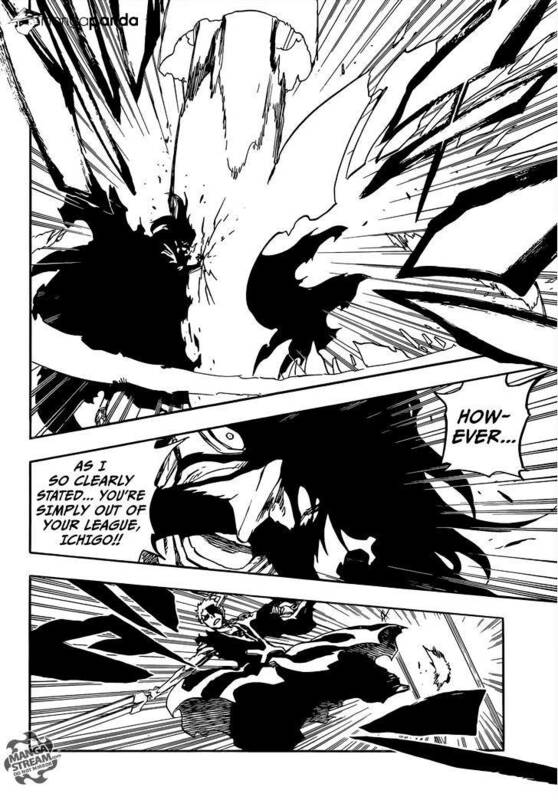 I've always glazed over a little at the explanations for how Ichigo's powers work, so if anyone understands what the hell it is Ichigo is talking about, feel free to explain in the comments. Anyway, Ichigo recommends that Orihime keep Santen Kisshun up and get her back to safety, before blowing the walls out of the entire top of the tower. Ywach, mock-impressed, says that it's time for him to actually bother drawing his sword, too. 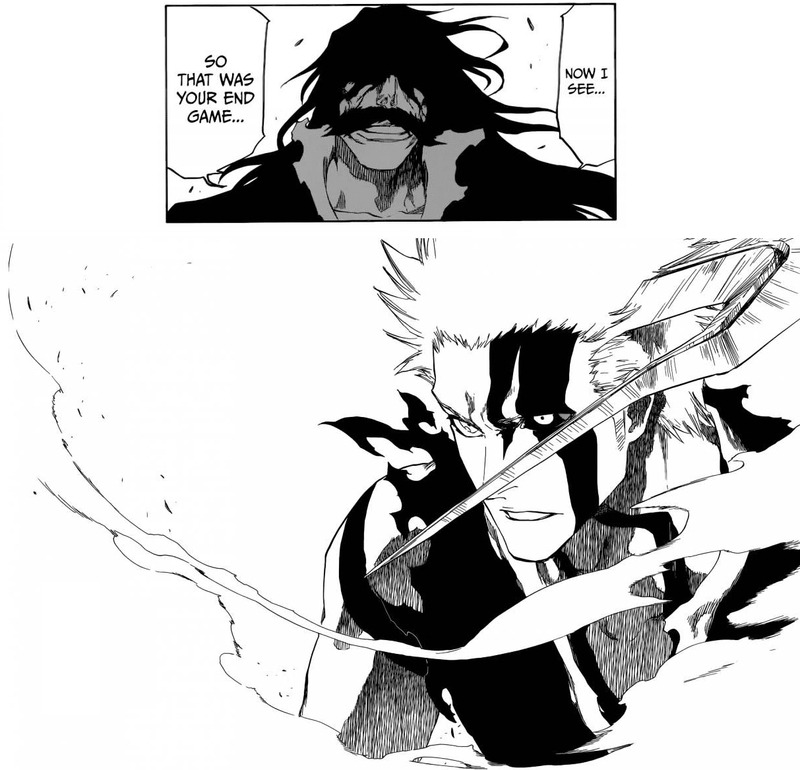 As he does, Ichigo grabs his hand before he can finish drawing it, and slashes down at him. Even more walls blow out. When we get back to the two of them, Ywach has just grabbed the blade with his bare hand and stopped it entirely. Forcing Ichigo back, he notes that Ichigo's starting to form a Getsuga Tenshou. At the last moment, Ichigo also starts forming something on the tip of his Hollow horn - a Gran Rey Cero. The attacks combine and hit Ywach, lodging in his left side. Looking only slightly worse for the wear despite the giant crescent poking out of him, Ywach commends the combined attack, adding that it's fitting for a "mutt" like Ichigo. 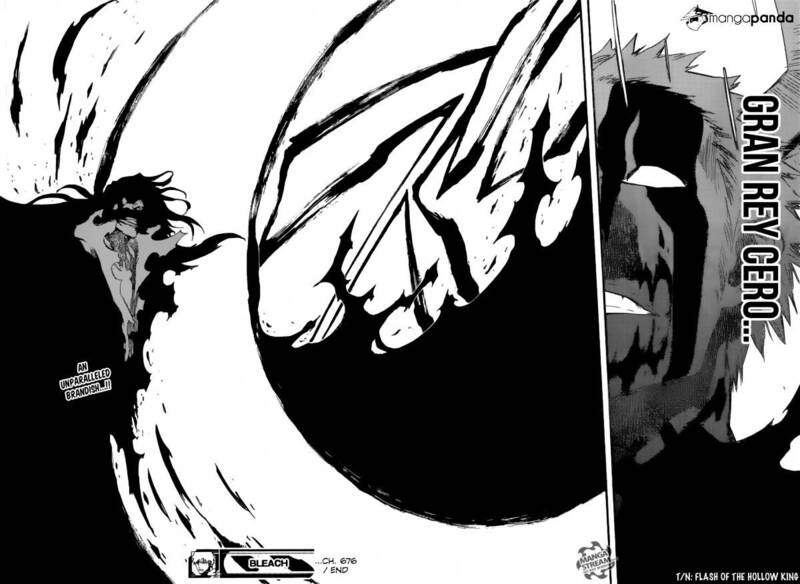 He reiterates that Ichigo is no match for him and destroys/repels the Getsuga Tenshou back at him. 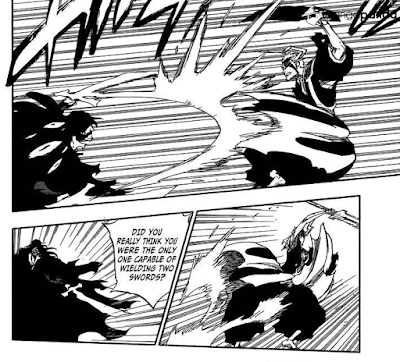 Ichigo dodges it and resumes attacking with his sword again, this time being blocked by Ywach actually raising his sword. Ywach says that he can read Ichigo like a book, and rattles off a list of tactics that he can tell Ichigo is thinking of using, revolving around catching Ywach by surprise while he's still just toying with and underestimating him. Ichigo: "Oh god, I don't really sound like that, do I?!" Following up on that, he activates The Almighty and the cluster of googly Mimihagi-esque eyes appear all over him again, indicating that he's at least taking the fight slightly more seriously now. We check back in with Orihime, who was protected by Santen Kisshun from the blasts, but has been blown back down they stairs they used to approach the throne room. Up in the rubble-ified throne room, Ichigo and Ywach continue to clash with their swords. 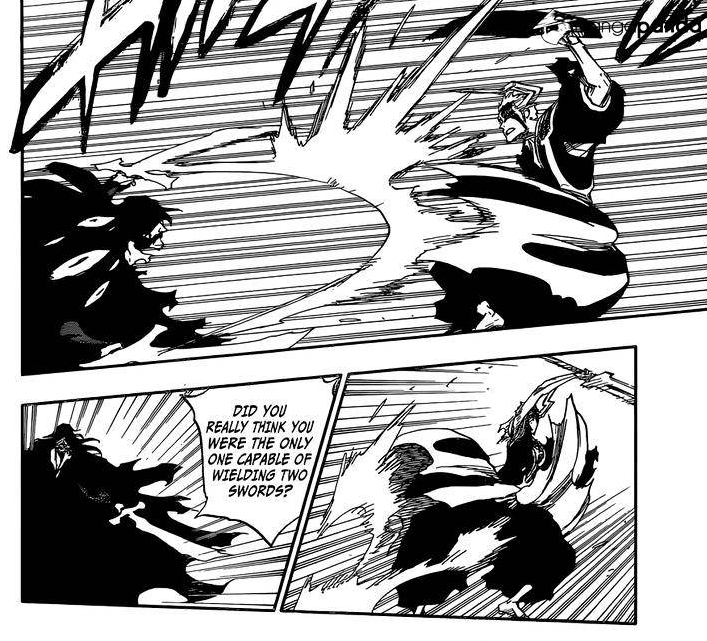 Ichigo tries to sneak in a hit with Little Zangetsu, but Ywach summons a second sword in his other hand and blocks it. He... probably thought exactly that, now that you mention it. Ywach warns Ichigo that he should watch where he's stepping, as a black tentacle pierces Ichigo's foot from under the ground. 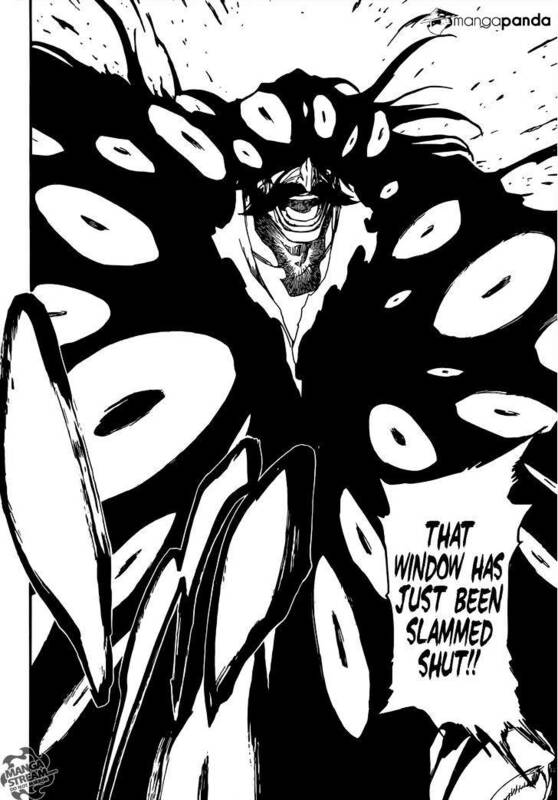 Ichigo jumps up onto a pillar, attempting to use it to propel him for an attack, but another black tentacle pierces his foot from there, too. He crashes to the ground, and realises that Ywach must have used The Almighty to place traps all over the room, knowing where Ichigo is going to stand. Ichigo declares that if The Almighty can see everything that's going to happen, then his next attack shouldn't even hit Ywach. Ywach grins and blocks it with his sword. 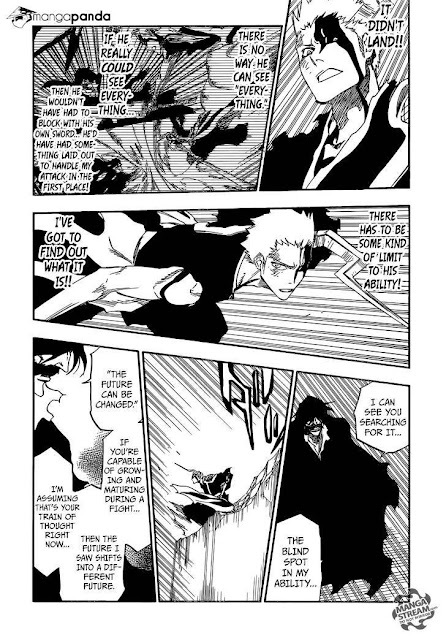 Ichigo reasons from this that there have to be limitations to The Almighty, or Ywach wouldn't have even needed to block - he'd have set up something ahead of time to prevent it. Well, maybe, Ichigo, but you're not taking Ywach's laziness into account - it probably takes less effort to just block it in the moment than to set up some elaborate countermeasure. Ywach comments that Ichigo is probably thinking about The Almighty's limitations, and that the future that Ywach sees can be changed. You know, "free will trumps fate" and all that garbage. As Ichigo stops to rest on top of a broken pillar, Ywach suggests that if he believes that it can be changed, then he should stay right where he is. 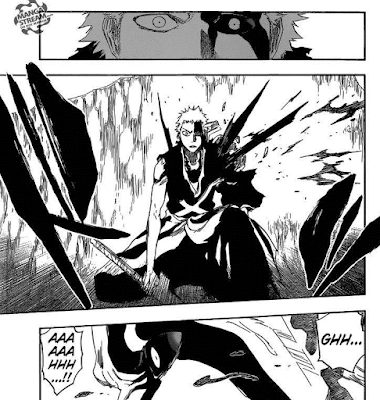 It's revealed that a number of black tentacles have burst out of the wall behind Ichigo and stabbed into his shoulder, destroying that little pauldron thingie he's been wearing since he got back from the Royal Realm. In Ichigo's defence, the power to see the future inherently makes no sense. As Ichigo collapses, Ywach corrects his notion that the future is linear: it's more like an unlimited number of grains of sand. Each of those futures contains a "hope", and changing the future is just a matter of jumping from one grain of sand to another - and using The Almighty, Ywach can see each and every one of those futures as clearly as each other. He encourages Ichigo to keep hoping and trying to change the future, rather than despairing. Well, you could get him a pet and then watch him gradually lose interest in looking after it - I hear that's pretty frustrating. Ichigo, who apparently was not really listening to Ywach's explanation of the flow of time itself, emphasises how often he's already faced despair in the past to get to where he is now. He activates his Bankai and so, so many nerd bladders start gushing. Hmm, about average. 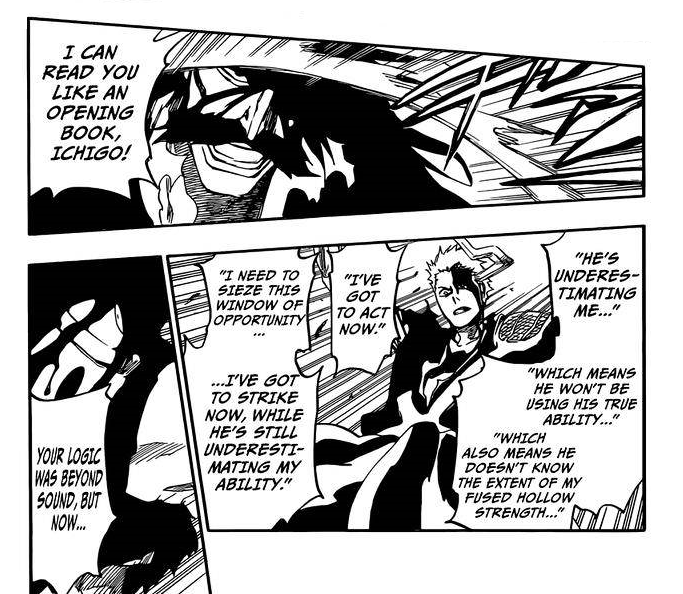 These chapters are mostly a focus on Ichigo's new abilities, which are okay, I guess, but nothing special? Ichigo as literally half-Hollow is a great visual (and something that's been long-foreshadowed), but he doesn't make much change in his approach besides the combined Getsuga Tenshou and Gran Rey Cero. From this point, the only way I can see The Almighty losing without being just being overpowered by brute force would be if Ywach wants to lose, and consciously chooses to go down a path that will lead to his loss. Does anybody else have any suggestions? Ywach's black reiatsu is really starting to crowd out the panels and make it a little hard to tell what's going on, although that could just be the quality of the scans. The focus has gone back to just this single area, which makes this feel a little drawn out. As 3 out of 5 sands through the hourglass, so are the days of our lives. 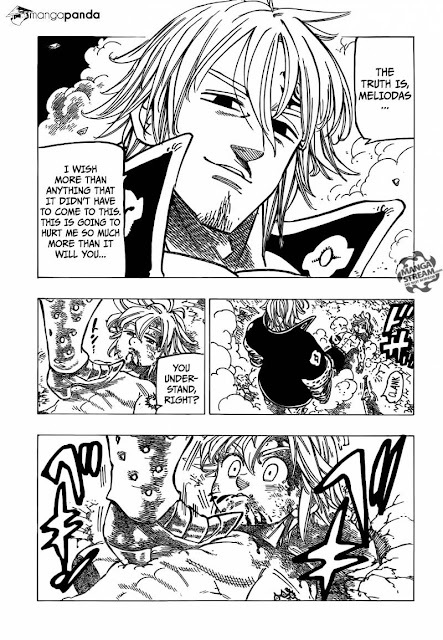 Arthur demands that Gilfrost teleport him to Meliodas, but Gilfrost refuses to send him to his death. They squabble, and Arthur notices an odd ring on Gilfrost's finger. Back at the battlefield, Fraudrin gloats about the situation, commenting that he's waited a long time for revenge since Danafor and attributing the blame for the things he did to Hendrickson and Dreyfus to Meliodas. 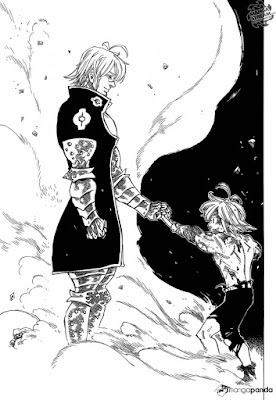 Meliodas tries to reach Dreyfus inside Fraudrin, and Dreyfus seems to briefly regain control, a tear rolling down his cheek. Suddenly, he blasts Meliodas with an attack and starts laughing, revealing that it was just a cruel joke. Gloxinia joins in the attack and uses Basquias to hit Meliodas, taking off his right arm. When the dust and smoke settle, Zeldriss declares that Meliodas' death will be their first act of vengeance, for his part in their original defeat. Suddenly, Meliodas comes to life, swinging his sword around him in a whirlwind. Everyone recognises it as Revenge Counter, and the assembled Commandments either look apprehensive, outraged, or outright terrified. Well, all 'cept one. 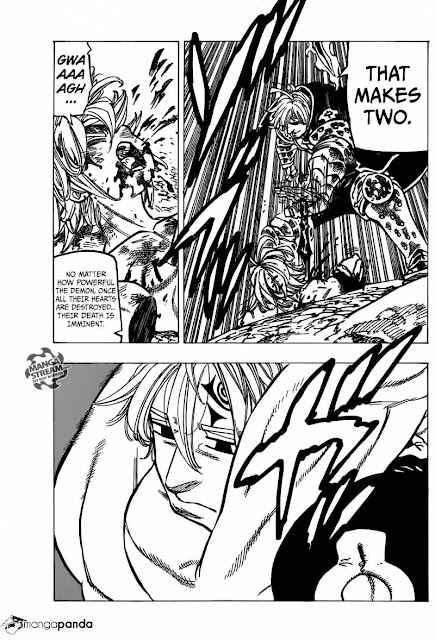 Just as Meliodas is about to release it, a hand grabs the blade and stops the attack: Estarossa's. Meliodas loses his strength and collapses. Estarossa, standing on his chest and smirking, declares that killing Meliodas is going to hurt him more than it will Meliodas, since he loves him soooo much. Meliodas screams in pain. Meliodas continues screaming and Estarossa continues smirking. With the Commandments saved at the last moment, Merascylla asks Gloxinia to heal her full-body burns. He obliges, but warns that it'll be the last time he can do any healing for a while. 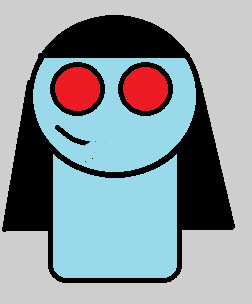 Derriere looks askance at something, and tells Estarossa that she has something to say. Monspiet guesses, correctly, that it involves the invisible presence of everybody at Liones Castle watching them, particularly The Seven Deadly Sins. Estarossa asks Meliodas when he was planning on betraying them, like he did when he was the leader of The Ten Commandments. 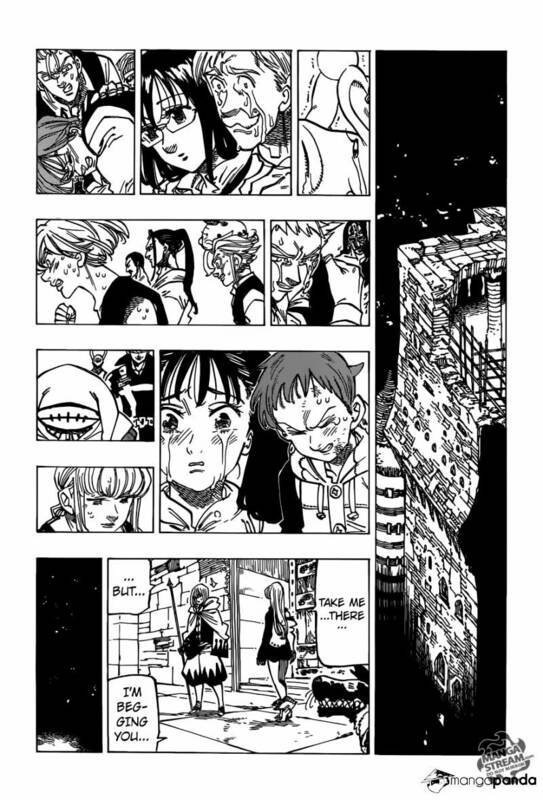 Cue flashback: Meliodas leading a group including himself, younger versions of Estarossa, Galan, Merascyllla, Derriere, and Monspiet, as well as three unfamiliar characters and someone who appears to be Gowther. Cue flashback scene: Young Estarossa, bloodied and in rubble with an injured/dead character with a face resembling one of Grey Lord's masks. A goddess (?) prepares to attack them, but is cleaved in half by Meliodas. Estarossa narrates that even he yearned to be like Meliodas, while past Estarossa gazes raptly up at Meliodas. Skipping what's presumably a very crucial part of the story, Estarossa says that Meliodas then suddenly betrayed them and killed two of the Commandments as he did so (who were later replaced by Gloxinia and Dolor), and that his betrayal left them open to a combined attack by the goddesses, the giants, the humans, and the fairies, which started the war from 3000 years ago. 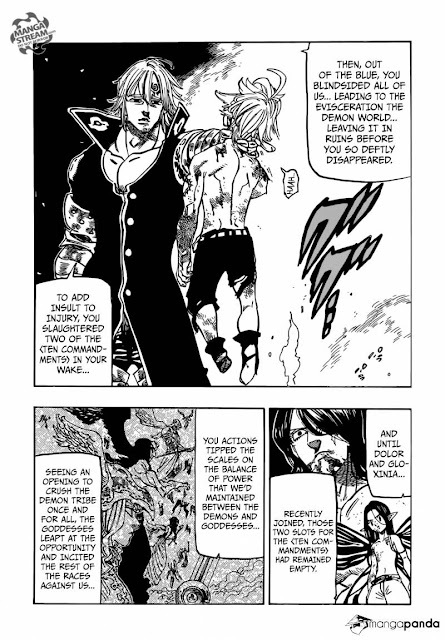 Estarossa throws Meliodas around a little, and as he tries to croak some words out, Merascylla pipes up and volunteers to be the one to finish him off, in revenge for Ban and Escanor's actions against her in the past. Estarossa seems miffed, but he doesn't object. Mer, has eating souls ever worked out well for you? Ever? As Merascylla starts sucking out Meliodas' soul while Estarossa gives her the side-eye, Ban appears on the battlefield. As it's revealed that the conversation he and Elaine were having was about killing Merascylla (and possibly reverting Elain back to being dead as a consequence), he uses Zero Sign to sneak up to Merascylla just as she pulls out Meliodas' soul. This is the weirdest life drawing class I've ever seen. Ban twists her head entirely upside down, and as she splutters and garbles, he uses Fox Hunt to rip out a bunch of her hearts. Then, he squishes them underfoot. Ban turns to address Meliodas, and Meliodas, smiling weakly, reprimands him for the stupidity of coming, and Ban grins and sticks his tongue out at him. Ban takes Meliodas' hand and helps him up. The assembled Commandments stare in surprise at Ban and Merascylla, who is apparently dead for real-reals now. Fraudrin recognises Ban and Zeldriss starts drawing his sword, but Estarossa, who's closest, just thanks Ban and adds that he would have killed her himself if Ban hadn't. He goes on to say that the right of killing Meliodas belongs to him. Well, maybe you shoulda just said something to Merascylla instead of being all passive-aggressive and murder-plotting-y about it. Food for thought, hmm? "You could have just said you wanted to do it..." "Nope, this way is more evil!" Estarossa continues placing swords into Meliodas like he's one of those magician's sword cabinets, as Ban helplessly grapples on his back and squirms around, trying to break his neck. 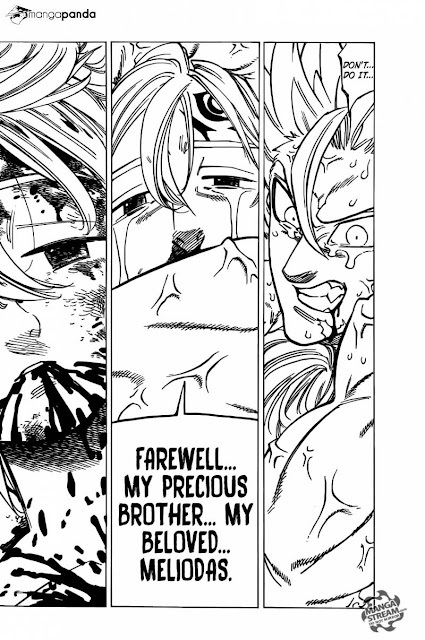 As Estarossa places the final sword in, tears streaming from his eyes, he bids Meliodas farewell. The job finished, he turns his attention to the Ban-on-his-back and blasts him into pieces, but he doesn't seem interested in doing any follow-up. He turns to the remaining Commandments and declares that Britannia is now theirs for the taking. They depart, as everyone at Liones Castle watches, crying or with solemn faces. Elizabeth demands that Gilfrost take her there, and with the danger past, he now does. 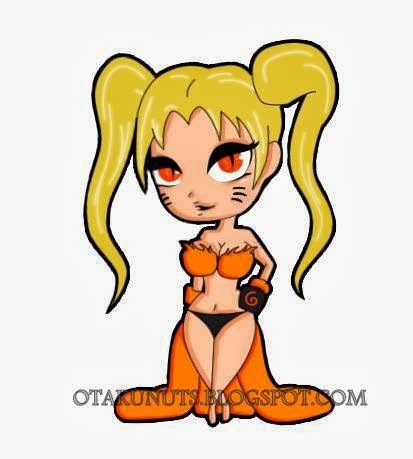 She wanders around in the wreckage until she finds Meliodas' body. She clutches him, begging him to wake up, as the sun sets overhead. Wah-wah. Meliodas is apparently dead - that's an interesting turn of events. At least, for the time being he's dead. It goes without saying that this won't be a permanent change, so the main point-of-interest next is in seeing how the others cope with his death at this low point. There's a lot of fan speculation right now that the method of Meliodas' resurrection will involve the Goddess clan in some way, which opens the door for more flashbacks. The past reveals were interesting, but sparse, but some interesting titbits were doled out about Meliodas' role in the Commandments and the previous makeup of the group - although frankly, more questions were raised than answered. If Meliodas was evil in the past, why did he change? Or conversely, if the Commandments were "good", why did they change? Why has Estarossa (and from what you see of them, Monspiet, Derriere, and Merascylla) aged while Meliodas hasn't? What was the deal with Grey Lord-ish demon? Meliodas actually lost a fight! Is this a first? Actually, there wasn't a whole lot of meat to the flashback, really. Uh, that was quite a comeback, Merascylla. Well done. 4.5 out of 5 still-beating demon hearts. Pomelote is the physical embodiment of first-world millenial entitlement. You can contact her on Skype with the name suukebind or Twitter at @poorlicoricekid, if you know any good spam bots.